With the end of the semester quickly approaching, college students are beginning to feel the stress of last-minute assignments and final exams. We tend to get so caught up in our work that we don't "paws" to relax. This past week at Stevenson University we welcomed Pets on Wheels to help students reduce their stress and anxiety by spending time petting calm, good-tempered dogs. 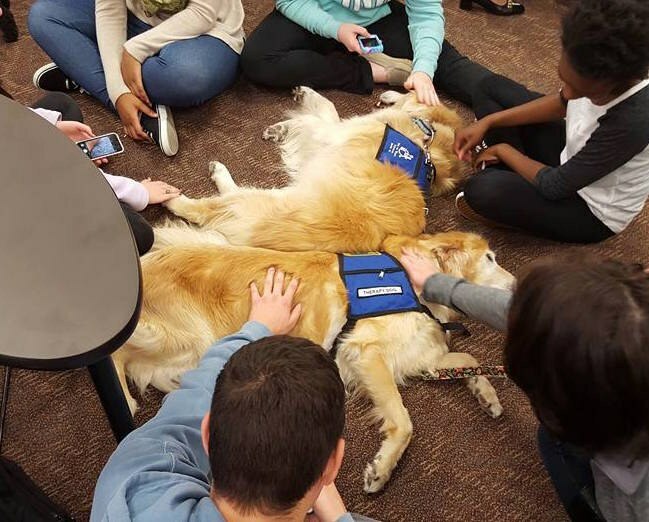 Pet therapy has become very popular in colleges and universities across the nation, which had me questioning, "what's the real benefit of therapy dogs for college students?" First off, who doesn't love dogs? There are days I find myself missing my dogs more than anything, so having them on campus can help students feel at home. But, most importantly, interacting with a friendly, gentle pet has been scientifically proven to provide significant benefits to both mental and physical health. Therapy dogs have been shown to lift spirits and lessen feelings of depression and anxiety. In a survey of college students conducted by the Associated Press and mtvU, 80% of students said they frequently or sometimes experience daily stress, 34% felt depressed at some point in the past three months and 13% had been diagnosed with mental health conditions such as an anxiety disorder or depression. These percentages are alarming so it is important that stress relievers (such as therapy dogs) are provided to students, ideally throughout the school year. Physical side effects of stress and anxiety can include excessive ongoing worry and tension, muscle tension and respiratory or cardiovascular issues. But, interacting with therapy dogs can lower blood pressure, improve cardiovascular health, release endorphins and can create an automatic relaxation response. This is exactly what college students need during periods of increased stress, such as final exams week. Taking a moment to relax can help them regain the motivation they need to finish out the semester. Therapy dog handlers are usually volunteers for a non-profit organization, such as Pets on Wheels, making this a nearly cost-free anxiety reducer available to universities. I hope to see therapy dogs at Stevenson University more often and become a norm on all college campuses.